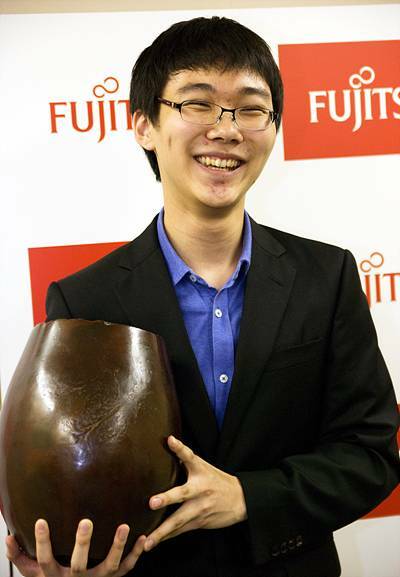 Park Junghwan 9P (below) won the 24th Fujitsu Cup on August 14, defeating Qiu Jun 8P by resignation in 223 moves. The game, which was full of creative moves and severe fighting, ended in an enormous life and death struggle that Qiu lost. At just 18 years old, Park has not only taken his first major international title, but has also broken Lee Sedol Park Younghun 9P’s record as the youngest player to win the Fujitsu Cup. However, he is not the youngest ever to win an international title; that record is still held by Lee Changho 9P. En route to the final, Park also defeated Ogata Masaki 9P, Chen Shiyuan 9P, Piao Wenyao 9P and Iyama Yuta 9P. Qiu, for his efforts, will be promoted to 9P for reaching this final. - Jingning; based on her original reports on the 24th Fujitsu Cup, at Go Game Guru. Photos: Upper right; Qiu Jun 8P (left) and Park Junghwan 9P. Below; Park Junghwan 9P holds the Fujitsu Cup.